Be prepared for the unexpected emergency with Guardian Survival Gear. No one knows what might come during a disaster, or what gear they might need to survive. Having the survival necessities will be critical to get through that disaster, and the two person survival kit is a fantastic starting point to ensure that your family is protected and has what it needs. These survival packs are compact, highly portable, and easy to store in a closet, under a bed, or the trunk of your car. All items are packed securely in our Multi-pocket Hikers Backpack which contains extra space available for personal items. Because this necessities kit contains a wide range of survival gear, you will be feel much safer and a greater peace of mind knowing that you are setup to withstand all sorts of problems that a disaster situation throws at you. 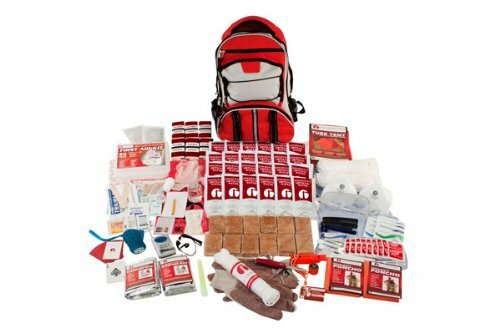 A well thought out disaster kit contains only useful items that will help you survive an emergency. Having a home survival pack already stuffed full of important items that would be easy to grab on the way out of the door in an emergency could be the most important item in your emergency supplies. Being prepared with shelter, protection from the elements, a first aid kit, survival tools, hygiene basics, and more will allow you to not only survive, but thrive during a disaster. Prepare for whatever may come with a premium survival kit aimed at arming your family with the essential gear necessary to make due in the face of disaster. If you have any questions about this product by Guardian Survival Gear, contact us by completing and submitting the form below. If you are looking for a specif part number, please include it with your message.